i run a simple helloworld program but the output shows some square characters. what is it? why i cannot see the print message? I'm really not sure if this will help you but have you tried having your main method like this? Seem odd to have a square character next to the "args" in your main method. Looks like a font problem, have you tried different fonts? Second, I would agree that your font might be screwed up. I'm not sure which IDE you're using, but you should be able to change it to support your character map. That's not 100% accurate, but it should give you enough to start from. 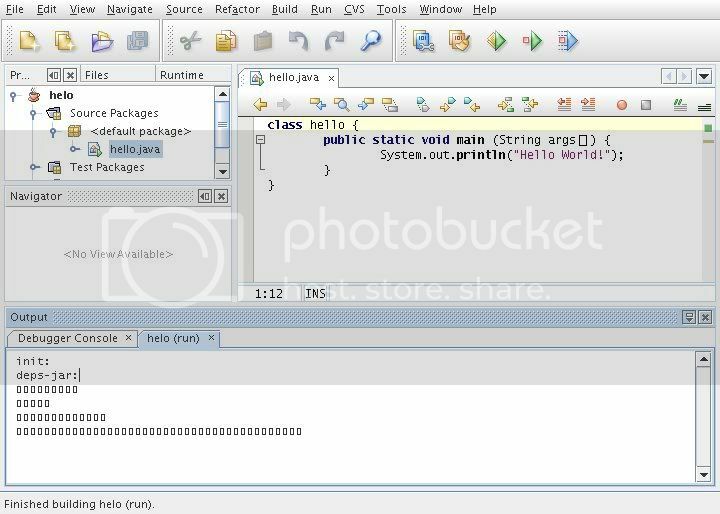 I'd also recommend checking out the Java Docs in your IDE - most IDEs have decent documentation built in. Last edited by dk_netsvil; 8th April 2009 at 07:56 PM. Remember, http://marc.info/ is a wonderful resource for the Open Source community. OpenBSD users should consider this as an authoritative resource on par with the manpages. Use them both, & use them often. ...& flossing after every meal is good too. I faced same on OpenBSD 5.7. I installed NetBeans 6.9.1 from OpenBSD's packages repo but ended up with same issue. After short search in google I found the thread that Ocicat mentioned earlier. Based on it I installed 'lohit-fonts' package from the repo. The only result is that instead of boxes I can see empty lines. Do you know any other solution for the problem ? I don't use netbeans. But a quick look at the port showed me that this is discussed in the OpenBSD-specific readme file, which should be installed in your /usr/local/share/doc/pkg-readmes/ directory. Thse are in fonts/lohit-fonts package. Firstly even after X restart the result was only no output at all (empty output). Now I gave it the last chance and for unknown reason it started to work - I can see all output. Tested on Netbeans 6.9.1 from ports and on 8.0.2 downloaded as OS independent .zip file from Netbeans web page.